All orders placed before 3PM that are in stock will be delivered next working day. All Eibach alignment products come with a 2 year manufacturers warranty for your peace of mind. Our stringent quality management ensures that you will receive market leading suspension technology. 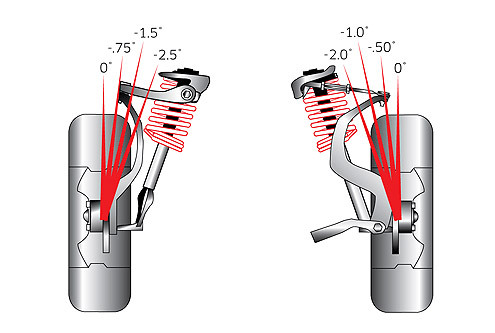 Once a vehicle is lowered, wheel camber may become excessively negative, meaning the top of the tyre is angled inward (toward the centre of the vehicle). While some negative camber aids in improving traction and road adhesion, too much can result in compromised handling and accelerated tyre wear. Eibach Performance Control arms are designed to allow wider wheel and tyre combinations and solve tyre-rubbing problems when teamed up with our front and rear Pro-Alignment camber kits and toe adjusters. Available for most popular applications. ATTENTION! Please note that there are no TÜV homologations for Pro-Alignment available yet! Sales, service and technical advice will only be offered through Eibach UK. 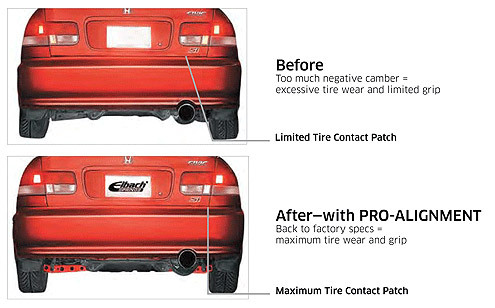 *The numbers shown represent averages–actual camber change will vary depending on vehicle model.